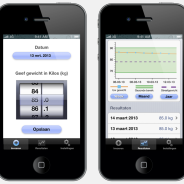 With the iOS Track my weight App users can easily track their body weight over time. Your weight over time will be displayed in a graph. And your body mass index (BMI) and healthy weight range will be calculated based on your length. Additionally, you can set your personal target weight.